As some readers may know, in another life I am a bit of a freelance journalist. Not enough of one to be able to give up administrative temping (unless I wanted to live in a shoe somewhere, but that would be ridiculous – where would I plug in my laptop? ); but enough that occasionally I get to do interviews. This being festival time, I managed to secure a couple of pretty cool ones. I think I first came across the Dresden Dolls in 2005. My sister played me a song called Half Jack and Coke cause she thought I’d like it. I did, but I absolutely loved Coin Operated Boy. And if ever you hear Girl Anachronism at a rock club night, it lights up the dance floor. Of Venue 2 at the St Andrews Student Union, at any rate. 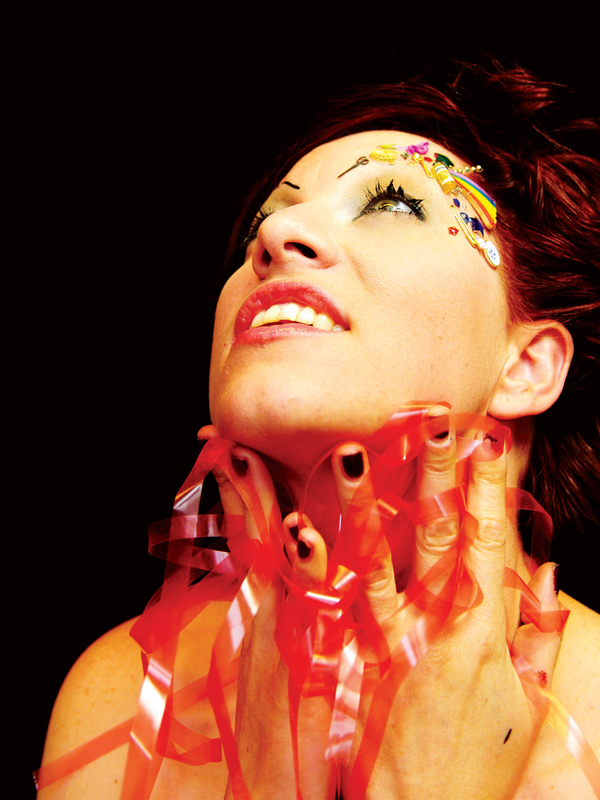 The Dresden Dolls made a couple of albums and then the singer, Amanda Palmer, went solo. I sort of dipped in and out of what she was doing – the campaign to get Roadrunner to drop her after label bosses said she looked fat in promotional pictures, the release of a book, Who Killed Amanda Palmer, containing stories by Neil Gaiman, the ninja gigs where she uses the flashmob idea to get hundreds of fans in the same place at the same time to hear her play for free, Evelyn Evelyn (the comedy cabaret act where she and Jason Webley play conjoined twins) and of course her Radiohead covers album, Amanda Palmer Performs the Popular Hits of Radiohead on Her Magical Ukulele. When Palmer’s publicity person responded to my email to say she was happy to let me interview her for Ten Tracks I was all at once star struck and concerned. Where the hell was I going to take her? I don’t know any places cool enough to bring a rock star, I spend most of my time drinking tea! As ever, pragmatism won out and I opted for Spoons on Nicolson Street on the grounds it is nice, central and shouldn’t be too busy. When I told my brother (one of the only people I know who would get the excitement of this; the people I hang out with these days are all far too indie orientated – where are Rocksoc when you need them?!) he was suitably excited… but then did a terrible thing. He voiced my as yet unspoken fear. “Maybe she would bring Neil,” he said. Since doing that book I mentioned, you see, Palmer did in fact marry Neil Gaiman, author of several of my favourite things. 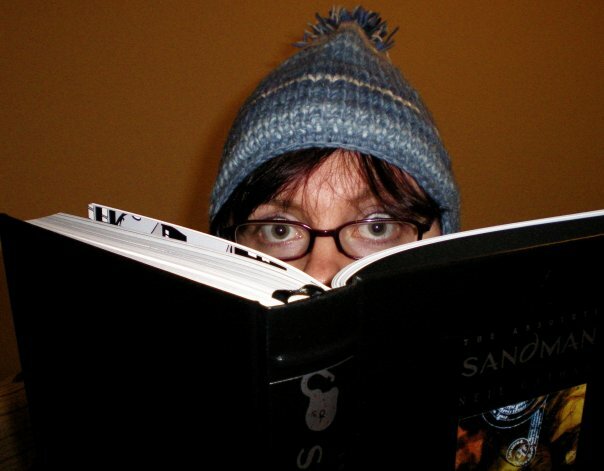 For about two years my avatar on all things was a picture of me peering over the top of an enormous hardbound anthology of Sandman, which is one of the best books I own (up against some pretty stiff competition). There seemed a fairly high chance she wouldn’t – as you may have read on Dorky Mum’s blog, the man is quite hard to track down – she had to interview him in a queue for tickets. However, as narrative necessity would have it, when I arrived (slightly late, much to my embarrassment), he was there as well. Amanda introduced us, and I tried to think of something pithy to say. In the end I went with “it’s really nice to meet you.” Brrapp. He then left us to it, which was probably just as well because meeting his wife was intimidating enough. Although this brief meeting seemed to be far more interesting to the bulk of my social media contacts than the interview with her (which you can read here, by the way). “I mean, Neil Gaiman! Did you ask him anything?” my flatmate enquired. Well no. It would have been crass to organize an interview with one person then ignore her because her husband was there. I try to be professional in the face of ridiculously famous people, yeah? It’s like, my thing. Plus he was only around for maybe 60 seconds. This was not an opportunity for a great meeting of literary minds – I was there in my capacity as music hack, not a novelist or squeeing fangirl. Anyway, having met AFP, I can completely see why her fans are so in love with her. She is really interesting and articulate and passionate about what she does, but more than that when you speak to her she pays full attention and is quite intense, looking you right in the eye to make sure you’re on the same page. I found it hard to stop staring at her long enough to take notes. One thing she said which I think I’ll keep with me in a 12 books sense was about asking for help. I spend a lot of time thinking I shouldn’t nag people to read my stuff, that it’s not ready to show off anyway, that the blog is too boring and I need to burn myself out making it worth people’s time when I ought to be writing, that I’ve already shared the fact there’s a facebook page a whole load of times and it’d be annoying of me to ask people to share it again… Whereas if I just said screw it, I will continuously ask people to read about and share the project, maybe I too would have enough contacts to crash on floors in all the major cities of the world. Or at least an advance. I met Neil Gaiman once. I got him to sign my copy of Good Omens. I apologised for not buying his new book as I was a poor impoverished student and I needed to eat. He seemed to understand. I have never met Neil Gaiman. He said all the things he has said since he was born during that time. Maybe one day there will be new things he will say for you. The interview is good. You can’t have been too starstruck. She says some interesting things. Well done! thank you! I think it helps that she is so nice, she picked up on me being nervous I think and definitely tried to put me at ease. I spose she gets it a lot!